Airplane Arts and Crafts for preschoolers through second grade. Purchase transportation counters at your local school store. 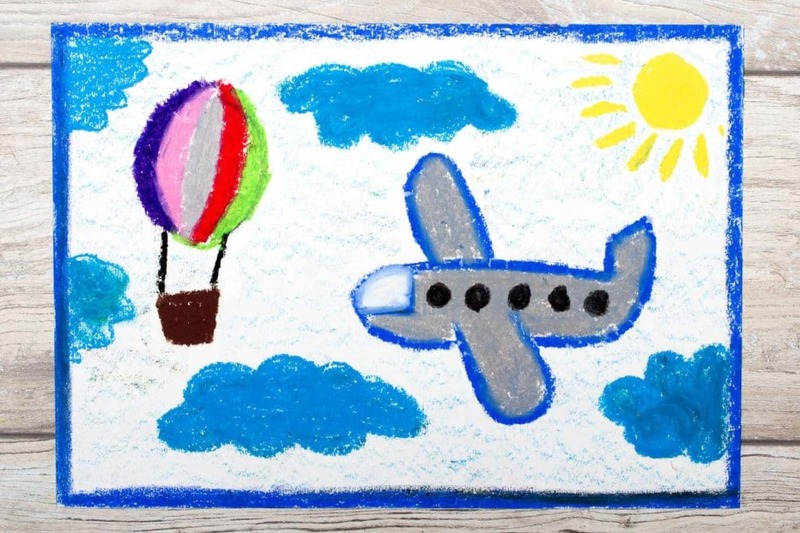 Use a few of the airplanes in this art activity. Children like to fly his/her airplane in a shallow pan of paint and land on paper. This is very pretty with different colors of paint. This is a bulletin board that the children will enjoy making. It is a three-day process. On the first day, the children are given large, green, tree-top shapes and asked to make collages. They can use dried peas, green tissue paper, green paint, any materials which are green to make their own unique collages. On the second day, the children are given different shades of blue paper, scissors, glue, cotton balls, and glitter to make their own clouds. On the third day, they are given a picture of themselves which can fit into a square shape inside different colored airplane shapes. They can choose whatever color they want and decorate their planes however they want. The green collage tree-tops are placed on the lower section of the bulletin board and the clouds are placed towards the top area while the airplanes are scattered about the board with black “flying marks” trailing behind. The children will enjoy seeing themselves as pilots on the bulletin board. Fold a piece of paper into an airplane and have the children fly them all over!!! You can decorate them, too!!! Great for fine motor skills!!! We made airplanes out of paper towel tubes. I cut slits with an Exacto knife on the sides of the tube and cut wings out of poster board and inserted through slits. Children painted the planes. After dry, we added windows with a small, square sponge. To finish the plane, I used alphabet pretzels and had each child spell out his name in pretzels and glue to the side of the plane with tacky glue. They were displayed on a wire across the room and I hung white and blue crepe paper streamers in between the planes for sky and clouds. Glue the two paper towel tubes together so it looks like a cross. Cut a 4 inch by 2 inch rectangle out of the cardstock. Glue the rectangle at the end of the paper towel tube. This is the tail wing. Let the children paint and decorate their planes!